Inspired by Think Outside The Box Inside The Box’s theme to “create from what you have,” Founder Kelli Joan Bennett and writer, filmmaker, artist Leslie Ann Owen created the Declare Your Dream Experimental Motivation Project to motivate people to stop waiting to create, to declare their dream and to begin creating it from what they have right now. To spark creativity, motivation and action, people are being invited to anonymously contribute to the Declare Your Dream Experimental Motivation Project by creatively declaring their dreams and mailing them in to be a part of the experiment. Dreams can be goals, projects, movements, changes, or simply the type of person you aspire to be. Any dream can be declared as long as it’s positive, genuine and something you have always wanted to do or be. Does declaring your dream actually motivate you to take steps to act on it? 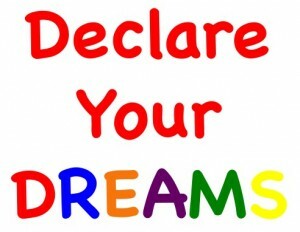 Does seeing other people’s dreams creatively declared motivate you to declare your own dream and/or act on your dream? What motivates you to act on your dreams? Does anonymously declaring your dream give you the confidence and freedom to dream bigger? Does declaring your dream make it feel more real, more doable, more possible? Does seeing a dream declared make your dream feel more real, more doable, more possible to make come true? Once your dream is declared and a part of the anonymous Experimental Motivation Project, do you feel held accountable to take action? The aim is to inspire every person on the planet to be brave and be bold in creating from what they have, to foster belief in themselves and their dreams, and to act on them right now. To find out how to anonymously contribute to the experiment and Declare Your Dream today, visit www.Declare-Your-Dream.com. See a Dream & get motivated! I have more than one dream, and I’m acting on them all. You always need a new horizon to aim for, because you are always moving forward. I like to create. So I am creating jewellery. I know how to create a design for a shoe, the next step is to learn how to create the shoe itself. It’s a constant cycle of learning and creation. I create fiction too. My stories develop from many different places but my inspiration mostly comes from the imaginary life I build for myself.